GT45 13PC TURBO CHARGER KIT MANIFOLD+OIL FEED LINE CHEVY SMALL BLOCK SBC CAMARO. 1 X Stainless Steel Top-Mount Turbo Manifold. 1 X 35mm/ 38mm Wastegate with Spring. 1 X Braided Oil Feed Line. 1 X GT45 V-Band Downpipe Flange. 1 X 8-Piece Piping Set. 1 X Aluminum Blow Off Valve. 1 X Aluminum 2.5 Flange Pipe. 1 X 3 Round Air Filter. 1 X Turbo Boost Controller. 1 X Box Style Turbo Timer. 1 X Fuel Pressure Regulator. 1 X Braided Oil Return Drain Line. Hardware, such as Gasket(s) and Bolt(s), if Shown in the Picture Above. 2 X 180 Degree U-Pipe. 2 X 90 Degree Pipe. 2 X 45 Degree Pipe. 66-75 Chevrolet Bel Air 5.7/ 6.6/ 7.4L V8. 66-72 Chevrolet Biscayne 5.7/ 6.6/ 7.4L V8. 1973 Chevrolet Blazer 5.0/ 5.7/ 7.4L V8. 1973 Chevrolet Brookwood 5.7/ 6.6L V8. 90-93 Chevrolet C-1500 4.3/ 5.0/ 5.4/ 6.2/ 7.4L V8. 91-95 Chevrolet C-2500/ Suburban All V8 Models. 88-95 Chevrolet C3500 All Models. 67-72 Chevrolet Camaro All Models. 66-75 Chevrolet Caprice All Models. 67-73 Chevrolet Chevelle All Models. 1968 Chevrolet Chevy II All Models. 66-74 Chevrolet El Camino All Models. High Compression/ Boosting GT45 Oversize Turbocharger. Capable of Boosting Horse Power up to 600+ BHP. High Quality Material, Cast Housing with Durable Steel. Standard 3.25 Inner Diameter V-Band. 3.75"/ 2.25". Stainless Steel Exhaust Tubro Manifold. High Performance Tubular Turbo Racing Design. Made of High Quality T-304 Polished Stainless Steel Alloy Material for Strength and Durability. Tubular Design to Ensure Equivalent Exhaust Flow Rate from each Cylinder. Computerized Mandrel-Bended to Maximize Air Flow Smoothness. TIG Welded CNC Machined Flange for Resistance against Cracking and Wearing. Increase Engine Exhaust Output and Efficiency. 38mm/ 35mm External Wastegate Port and Flange Included. Standard T4 (T04) Configuration Outlet. 35mm/ 38mm Wastegate with Spring. High Strength Cast Steel Body with Steel Head. Comes with 8-PSI Spring Installed. 35mm or 38mm Wastegate Dump Pipe Flange. Stainless Steel Braided Oil Feed Line. Made of High Quality Stainless Steel Hose. 1/8 NPT Fittings Natural Polish Finish. Made of High Quality T-304 Mild Steel Durable Material. CNC Machined Stainless Steel Flange. Inlet Flange Inner Diameter: 3.25. Overall Clamp Width: 4.50. Direct Bolt-On, High Performance Use. Made of High Quality T-6061 Aluminum Durable Material. Helps Reducing Engine Inlet Temperature. High Performance Bar and Plate Turbo Racing Design. Allow More Horsepower at the Same Boost Level and Even More Power at the Higher Boost Level. Intercooler Size: 31.00" (L) X 12.00" (H) X 3.25(W). Core Size: 24.00" (L) X 12.00" (H) X 3.25(W). Inlet/ Outlet : 2.25/ 2.25. Inlet/ Outlet Inner Diameter: 3.00/3.00. Made of High quality T-6061 Lightweight Aluminum Piping. Increase 65% Air Flow Comparing with other Standard Piping. Billet Aluminum, Anodized Finish Body. Draw In Surrounding Air and Release a Unique Discharge Sound. 40mm, Hard-Anodized Valve for Increased Airflow. High-Quality Diaphragm and Short Stroke Significantly Increase Response. Dual Spring System Promoted Response and Allows for High Boost Pressures. Holds Up to 30 PSI Boost Pressure. Aluminum 2.5 Flange Pipe. Fits Type-S/Type-RS Dump Pipe Flange. Construction Prevents Warping due To High Heat. Made of High Quality T-6061 Aluminum, Lightweight Design. 3 Round Tapered Cone Air Filter. Made of Reinforced Material and Covered with Chromed Finish for Lightweight and Durability. 3" Filter Inlet, 3" Inner Diameter Pipe, 6 Overall Height. Performance: Improves Up to 95% Filtration Efficiency. Micro Cotton Gauze Type Filter Material, Washable with Water or Soap, and Reusable. For Intakes or Turbo Usages. CNC Machined Aluminum Anodized Finish Body. Allows the vehicle to idle the engine, for the timed period, with the ignition key removed. Universal for all manual & automatic transmission vehicles both turbo-charged or non turbo-charged. Auto Mode - Precise calculation of cool down period to ensure proper cool down of turbo-charged engine. Digital display - Allowing you to see during day & night time. Adjustable from (1-15) psi to (140) maximum fuel pump capacity. Fuel pressure regulator can deliver vehicles highest performance, with long life and high reliable operation. Adjustable fuel pressure regulator with 1:1 ratio. Comes with hose and bolts install kit. Stainless Steel Braided Oil Return Drain Line. Made of high quality CNC Steel & Aluminum. Improve turbo performance by draining excessive oil, and can recycle oil back to the turbo. DOMESTIC LOWER 48 US STATES. AK / HI / PO BOX. We are not responsible for incorrect or undeliverable addresses. Not all of our items can be delivered to a P. Expenses of reshipping or rerouting for incorrect or undeliverable addresses would be buyers' responsiblity. Or undeliverable address has been provided to us. Please understand that we have no control over carriers' transit time. And the city of destination. US Territories and Military such as GU, VI, SAIPAN, APO/FPO and Virgin Island are not included in the 48 Contiguous States. For emissions related items, please check with your local jurisdiction for emission specific requirements before purchasing. All items do not come with installation instruction unless otherwise specified. We will reply to you as soon as possible except for weekends or holidays. 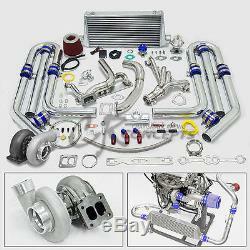 The item "GT45 13PC TURBO CHARGER KIT MANIFOLD+OIL FEED LINE CHEVY SMALL BLOCK SBC CAMARO" is in sale since Wednesday, June 11, 2014. This item is in the category "eBay Motors\Parts & Accessories\Car & Truck Parts\Turbos, Nitrous, Superchargers\Turbo Chargers & Parts". The seller is "charismatic_racing_concepts" and is located in Rowland Heights, California. This item can be shipped worldwide.